A rooibos tea is an herbal tea. Unlike most teas, which are made from the tea plant, a rooibos (Afrikaans, roughly pronounced roy-boss) is a member of the legume family. Only grown in Africa, the leaves of the "Red Bush" are harvested and fermented, which gives the resulting tea its trademark red coloration. The textures and flavors of this specific type of tea are complex. Some say it has an earthy, sweet taste and others liken it to a good cigar. Because the flavors are so unique, the only way to truly describe a rooibos is by its name: A rooibos tastes like a rooibos. 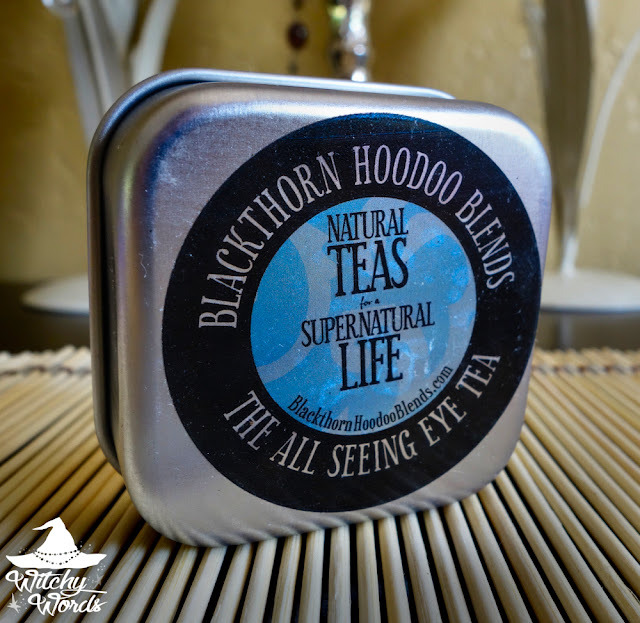 Knowing the definition of rooibos tea is absolutely essential to understanding The All Seeing Eye Tea by Blackthorn Hoodoo Blends. Amy, the owner of BHB, has extensive experience in teaching herbs and blending teas, and her company uses only the best and most ethically-sourced ingredients. To top it off, each tea is magickally charged for a specific purpose, making this pagan-owned small business and its products one-of-a-kind. 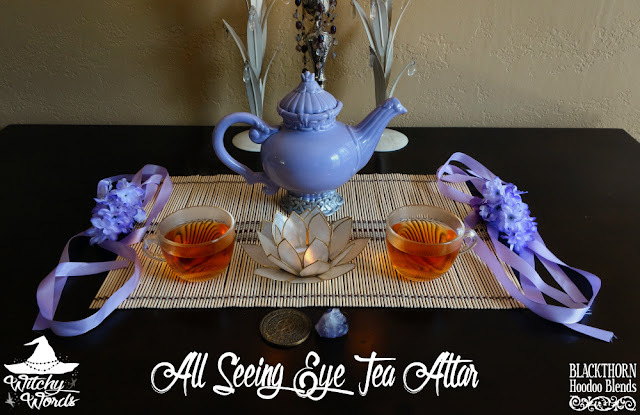 And The All Seeing Eye Tea is no different! The first thing you'll notice upon opening the tin of All Seeing Eye Tea is that it has a uniquly sweet, earthy and especially nutty aroma. The leaves are fine and thin, perfect for any kind of infuser you choose. Because of how fine it is, you'll want to use about one tablespoon per every eight fluid ounces of tea you plan on making. My teapots typically hold about 24 ounces, so I'm going to use three tablespoons in a full pot tea ball that is fantastically shaped like the TARDIS. 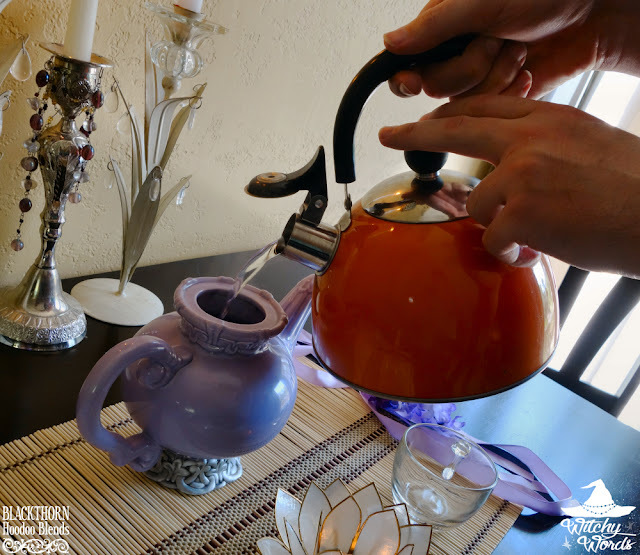 As for temperature, a good rooibos does best steeping at high temperatures near boiling, so feel free to transfer the water over to your teapot fairly immediately. You'll want to let this steep for a bit: 3-5 minutes is great for a rooibos to fully infuse. It also gives the water time to cool down to a more drinkable temperature. I'm particularly heat sensitive - I find I have to order child's temperatures at coffee shops or otherwise the skin on the roof of my mouth begins to peel. 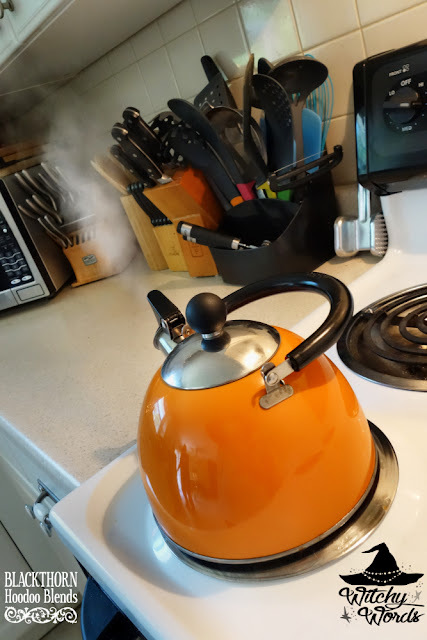 It's an awful affliction as a tea and coffee drinker, so even once we removed the infuser, I continued to let it sit just to give it some time to cool. 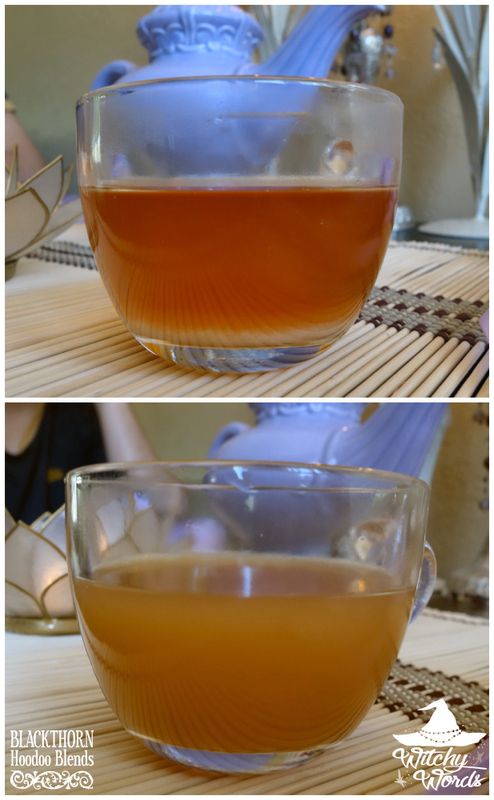 The tea itself should come out as a gorgeous and highly saturated red-amber color. The appearance is mostly influenced by the rooibos but also contains coloration from the honeybush this tea is blended with. You're sure to notice the prevalent deep, nutty aroma when being poured, but don't be surprised when the nut flavor is just an undertone of this complex and full-bodied tea. 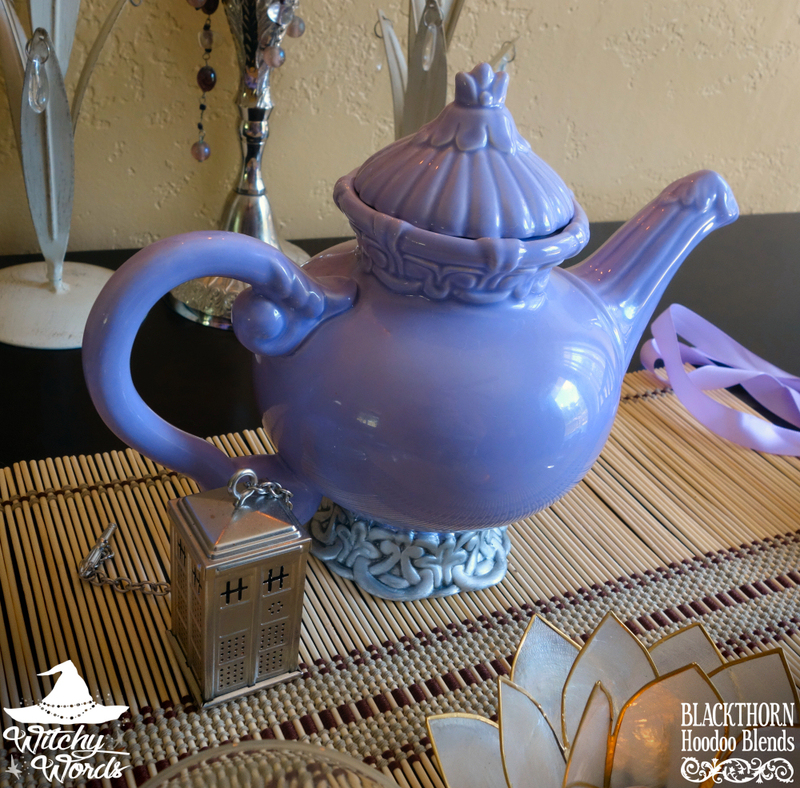 The flavor of this tea is going to be difficult to pin down as most rooibos teas are! That's a good thing. The rooibos itself has a slightly nutty flavor, so adding the natural hazelnut and almond flavoring only makes sense. 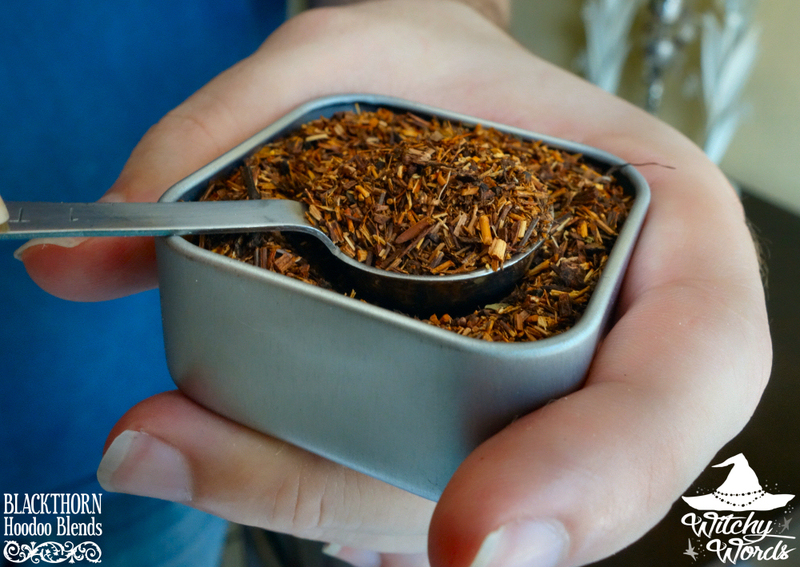 Still, rooibos is a pretty powerful herb and balances the nuttiness with a down-to-earth flavor. The honeybush blended in sweetens the tea and the vanilla flavoring smooths it out, making this a particularly rich dessert tea perfect for after dinner. If you're looking to emphasize the nut flavor, feel free to add a splash of milk - or, in our case, I used cashew milk since I'm lactose intolerant. The cashew milk was an interesting addition since, if you use the unsweetened version, it adds another note of nut flavoring to a tea with almond and hazelnut undertones. The creaminess of the milk goes particularly well with the earthy rooibos and the sweet honeybush, and emphasizes this as a smooth after-dinner snack. This tea is particularly filling, so feel free to share! The altar created for this tea is inspired by the energy found within the leaves. 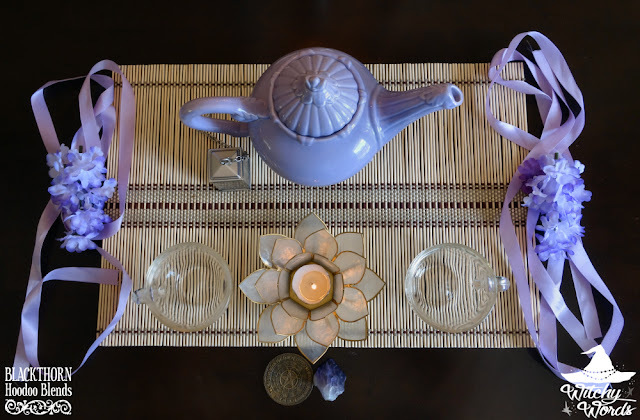 The All Seeing Eye Tea is meant to boost your intuition. 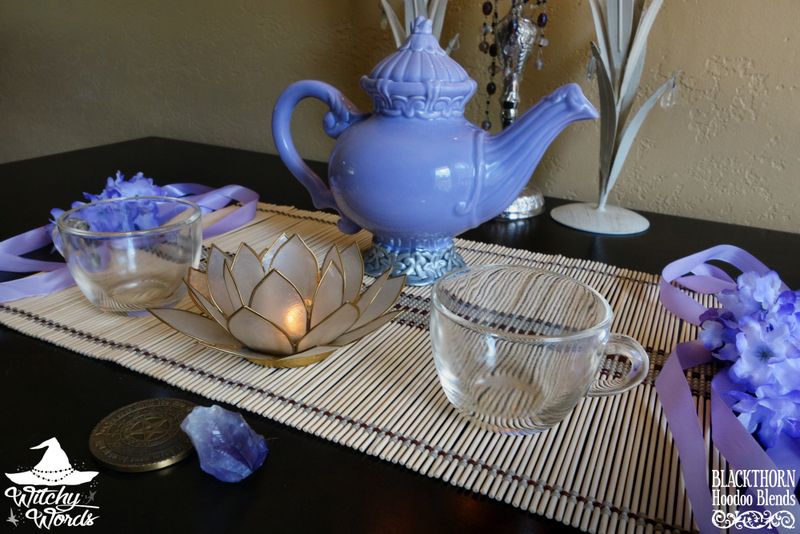 Colors associated with intuition include silver, indigo and lavender. 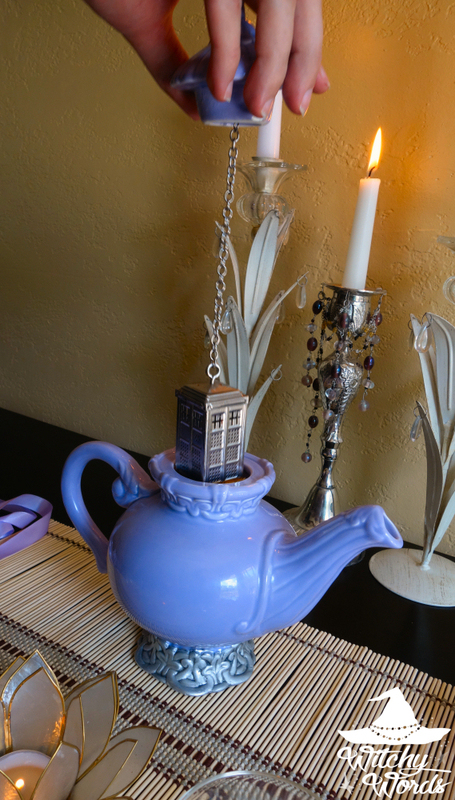 Since I have a silver and lavender teapot, we focused on the lavender. 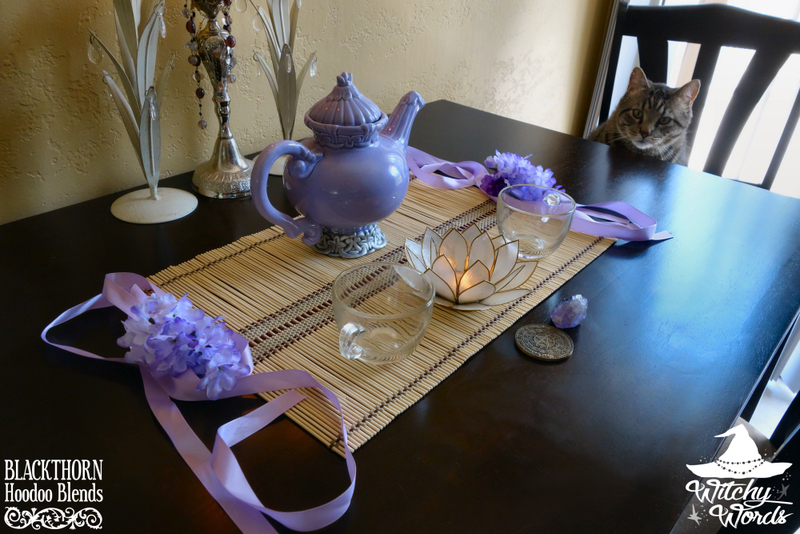 We added ribbon and flowers that matched the lavender color of the teapot to emphasize intuition and spirituality. 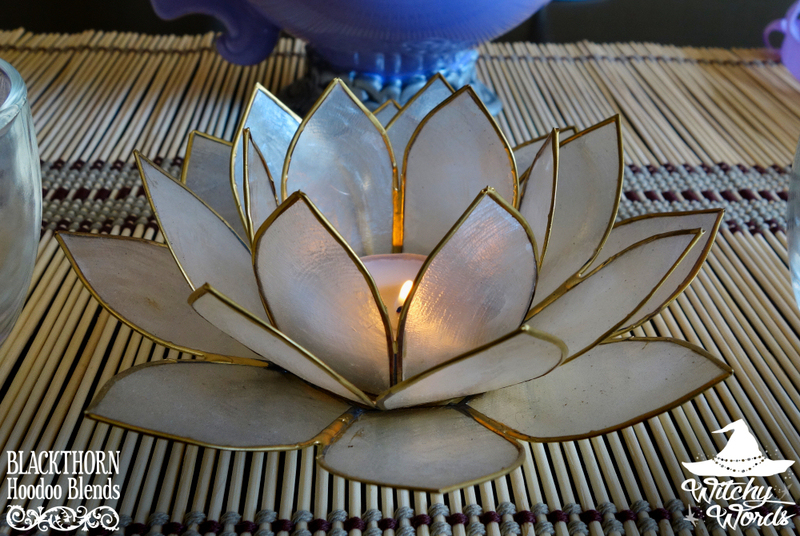 We also included a lotus flower candle holder as the All Seeing Eye references the Third Eye chakra. Chakras aren't exactly my area of expertise, particularly since it's borrowed Hindu culture, but it still seemed somewhat appropriate given the situation. In front of the altar, Tony placed his altar coin. I added a chunk of raw amethyst, the stone most closely associated with spirituality and intuition, to focus the intent of the altar and the tea. Behind the altar were three candles, one of which was adorned with amethyst beads. 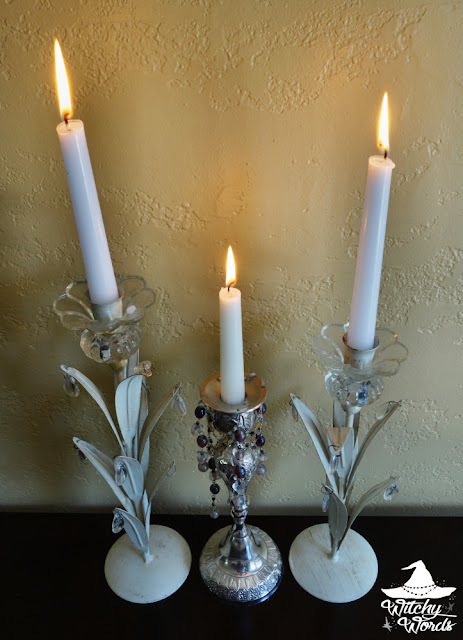 I absolutely love this taper candle holder - I found it at a thrift store for just $5! Since drinking The All Seeing Eye Tea, both Tony and I have been having vivid dreams about Samhain. 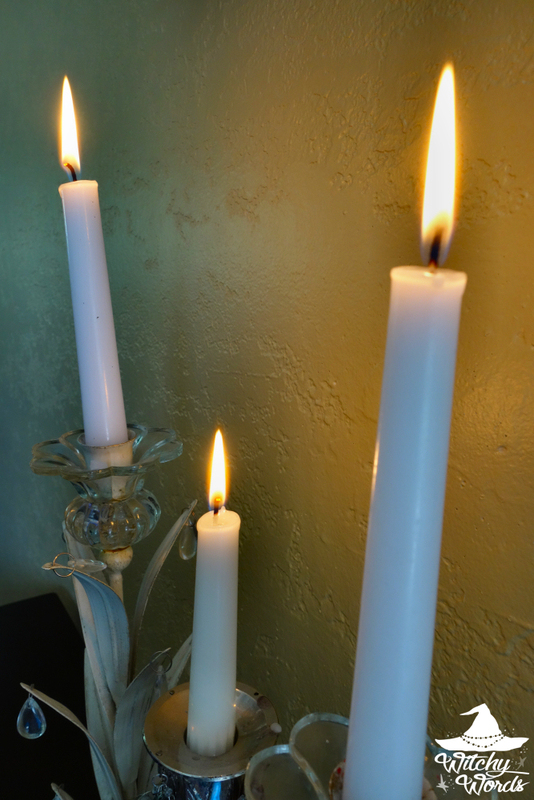 This is particularly unusual for Tony as he rarely has or remembers his, yet is now on week two of intensely rememberable dreams. Impressive! 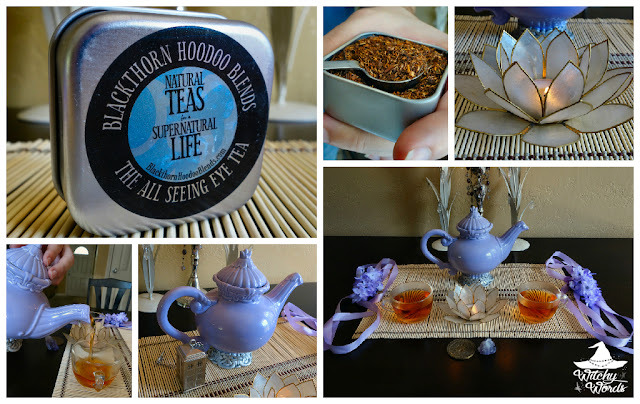 Overall, The All Seeing Eye Tea was a hit with our household! 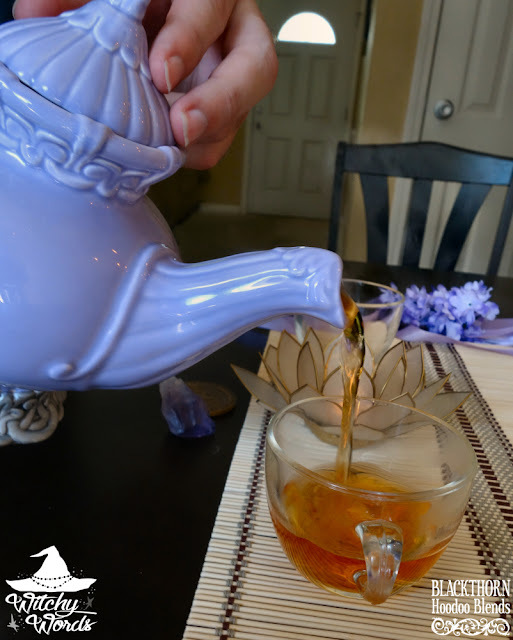 With its nutty nuances and flavors you really only find in a rooibos, it would be a great addition to any tea collection and worth serving after dinner to guests - but only if they want a side effect of vivid dreams that night! The lavender colors in the photos look so soothing! Yum.